ZeroWater is the only pitcher with filters certified to reduce Lead and Chromium. Be prepared to sample the best tasting water. Even if you live in a municipality that cleans or treats water, water can pick up chemicals on its way from the treatment plant to your faucet, giving your tap water a metallic and chlorinated taste. Water that’s purified with a ZeroWater filter, however, tastes the way water should: crisp, clean, and fresh. ZeroWater 5-stage filters are the most effective at removing virtually all dissolved solids (TDS) from tap water so you can enjoy TDS-free, pure-tasting water. 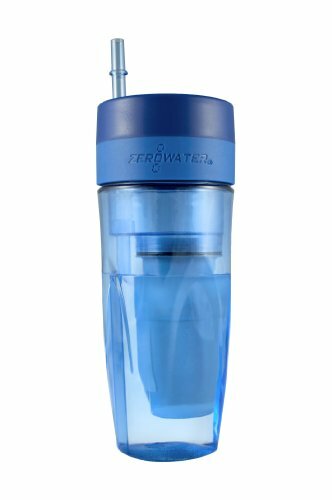 Combining the top performing filter with a sleek and convenient design, you can now have TDS-free water anywhere you go with our convenient, stylish portable bottle. Included is our next-generation filter change technology that indicates the precise moment a filter is ready to be changed. ZeroWater portable filters employ break-through technology that indicates when to change your filter. During regular use you will be able to see a color change through the built-in window. Flip, fill and lock lid design allows you to fill the bottle without removing the lid and eliminates additional pieces. ASSEMBLY: Remove lid and water reservoir from top of pitcher and remove filter from packaging. Twist filter into bottom of reservoir from below and tighten filter to obtain a complete seal with the reservoir. Do not drop the filter in from above. Tighten until there is a complete seal between the filter, O-ring and reservoir. Fill reservoir with cold tap water and place lid on top. Allow all water to pass through the filter before filling again. Dispense by pressing the spigot button to fill your cup or glass once the reservoir has emptied into the bottom. CLEANING: Clean your device in warm water using mild soap. Rinse and dry thoroughly. Not getting a “000” reading? Ensure that the filter is threaded correctly and fully seated in the water reservoir. Watch for cross-threading and ensure the black rubber gasket is seated properly and has not gotten stuck in one of the threads. Leaky spigot? Empty the water and ensure the spigot is firmly tightened to the device. Contact customer service if leaking continues. Reduce breakage: Do not place anything too heavy on top of your device. TDS Meter or Digital Light Indicator: The TDS meter is intended to measure total dissolved solids. Test your water regularly with the meter. For digital reading meters, change your filter when it reads 006 or higher. For light-up indicators, change your filter when the indicator lights up. Funny taste or smell from the water? Check your water’s TDS reading. It’s probably time to change the filter. If your water is testing below 006 or the indicator is not lighting up, please contact customer service for a replacement. Slow filtration? Due to the 5-stage technology, ZeroWater filters do have a slower flow rate, which ensures the purest-tasting water. Conventional filters with 2 stages will flow much faster, but will also not remove 99.6% of contaminants as ZeroWater will. If your water is not flowing through at all, you may have an air bubble. Putting some water on top of the filter and squeezing the filter to allow the bubble through should break up the air lock. Filter life will depend on two variables – how good (or bad) your water is and how often you fill up your device. Filters certified to reduce Lead and Chromium. Indicates when to change the filter. Hard to put water in lid when filling.